The first person interviewed for our new section is Gianni “Flash”, a person from Modena that has started his own Balsamic Vinegar cellar for a very special occasion. 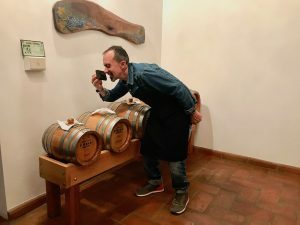 Have you always been interested in the Balsamic Vinegar production and tradition? If I have to tell the truth I wasn’t very interested in the production of Balsamic Vinegar at the beginning. I come from a family with farming origin that has never produced Balsamic Vinegar before, so it wasn’t part of our family tradition, but I started being fond of its production around eighteen years ago. Tell us more, what has happened eighteen years ago? My daughter was born! Actually, it is a tradition of the city of Modena to create a new array as soon as a daughter was born, so that she could use it as dowry. I didn’t do it for this purpose of course, I just wanted to do something for my new born, something to celebrate her birth, in fact the first thing I did as I bought the barrels was branding them with the writing “Miryea”, that is the name of my daughter. What are the steps you made to start this new “adventure”? First things first I bought the barrels, five to be more precise. I bought them from the best master cooper in Modena: the biggest one has a maximum capacity of 50 litres, while the smallest of 15 litres. Then I bought the grape must, a must that had yet started the process of acidification and I decided to buy it the must from the best seller in Modena too. Where do you have created your own Balsamic Vinegar cellar? At my house, I have some space, so I was able to keep it next to me and my family. Let’s talk about numbers. How much did you spend for your own Balsamic Vinegar cellar? A lot! I spent around five/six thousands of euro to buy the barrels and every year I spend two hundred euro to buy new must. At the end of the year to produce my own litre of Balsamic vinegar I spend around three hundred euro. Have you ever thought about selling it? Absolutely not! The only reason I created my own Balsamic Vinegar cellar was my daughter, now I keep doing it because it became a real passion! Moreover, if I would like to sell it I should have it certified by the Consortium and it is not something I really care about, even if now I have an eighteen years old Balsamic Vinegar! In addition I am not the only one, a lot of other family here in Modena do not “believe” in the Consortium certification, in fact it’s rare that a family have its own Balsamic Vinegar certified. So do you only use Balsamic Vinegar? Not always! I do not use it with salads, for example, but I really like it on strawberries and parmesan. My daughter instead use Balsamic Vinegar every time she has the occasion! She is proud to have a Balsamic Vinegar with her own name! Next Balsamic Vinegar Grand Prix in Maranello!